EPI: How do you see IFEM as different than other global organizations? What sets it apart? Ducharme: IFEM is unique; we’re trying to be both macroscopic and microscopic. We’re trying to network national societies and be a federation of national societies. We’re trying to get people to collaborate in networks of research while also propagating curricula for education programs In partnership with the World Health Organization (WHO) we are trying to develop emergency medical systems in hospitals through to nations in all countries, with a sharper focus on low and middle income countries. We recognize the breadth of scope we are attempting to take on, and need to remember that “You can’t boil an ocean with a candle.” You have to define the highest priorities first and you then focus on only those priorities until completion. If I try to say, we’re instead going to attack all of the areas I describe above at the same time, you would rightfully tell me that there’s no way IFEM can do all of that. It would be too many activities, and I would agree with you. EPI: What does that mean for IFEM practically? Ducharme: I believe that we need to have finite priorities as an organization. I believe some of the global idealism that nurtured IFEM for the first 27 years is inherently there and you see it in the passion of the special interest groups (SIGs). The physicians who are working the SIGs are idealistic and I don’t want them to lose any of that. It’s what drives them and gets them creating the beautiful projects that they do. While encouraging the SIGs to be innovative and passionate, the organization needs to drive select priorities by concentrating its (limited) resources on them. It’s something that I’m trying to develop as an organizational mindset. Being an emergency physician, I’d like something to happen in 30 seconds because that’s the timeframe I have when I’m working in the emergency department, but that’s not going to happen internationally. You always have to temper your time frustrations with reality. If I could succeed in my two-year term not just to get people to say, “Yes, this is the direction we need to go,” but actually embrace the mindsets required for us to go in that direction so there’s a commonality of thought, then I will have succeeded even if not a single project is accomplished. If we don’t lay the base properly, it’s like any construction. It will fall down. EPI: What are some of those building blocks you are working on in IFEM? What’s the foundation IFEM needs to build? Ducharme: Communication is key. When I worked in a private company in Canada, we would have meetings with HR talking about communication every week, stressing how important it was, and yet when there was a problem that arose in the company almost inevitably it went back to poor communication or misinterpretation. We don’t have a truly functional communication structure; you can’t build a proper foundation without that. Recently I was asked by somebody, “Can you name a medical organization that communicates well with its members?” and the answer I had to give was no. When associations produce guidelines and survey members five years after those guidelines are produced, somewhere between 2 and 5% of the members are aware of the guidelines. Physicians are inherently difficult to communicate with. I can tell you since I am a physician that physicians as a whole do not communicate well. When you add in 55-60 countries with 55-60 languages, that reaches a whole different level of communication requirements and complexity. When you get to know the physicians and make the connection, my experience has consistently been that commitment, honesty and diligence are always there. It’s getting them to respond, it’s getting them to commit, it’s that first part of communication that’s more difficult. The foundation we have to set up is a communications team that is effective. You would think in 2018 with Twitter and Facebook etc. communication would be straightforward, but there are multiple social media models with different ones used in different parts of the world. What we’ve done in the social media world is given ourselves multiple platforms, expanding even further the ways we can communicate - which paradoxically increases the complexity of communicating. You have to have an even greater presence and a stronger organizational communication system to reach out to all the various users of the different models and the different apps. 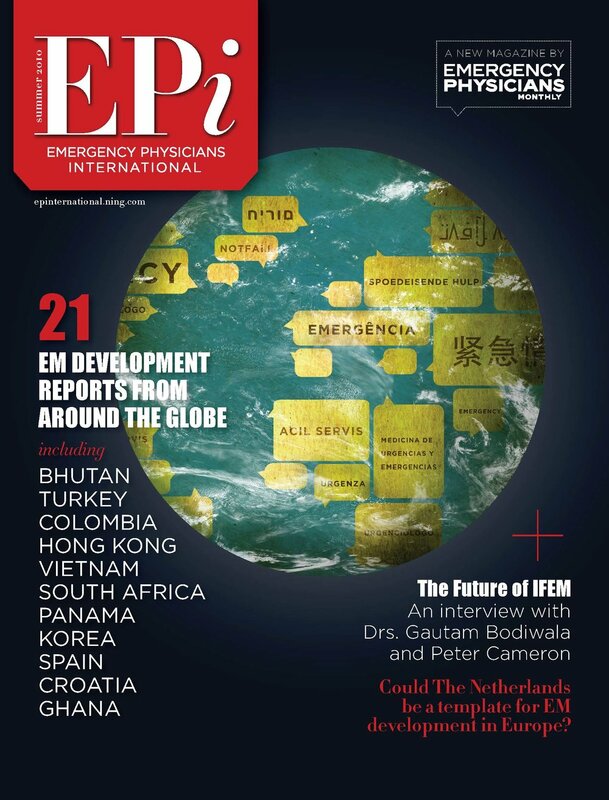 EPI: What specific first steps need to happen to bolster IFEM’s communications? Ducharme: The first step is getting our stories out to the world so that there’s a better understanding of what IFEM is and what it can accomplish - branding. I think that if we don’t get that message out, when we approach people, philanthropists, NGOs, or governments, thy will not understand what we can accomplish. The result of that will be a failure to ‘connect’, leading to an inability to build the base that we need, obtain the funding models we need, or to get people to understand the direction we wish to pursue. The first step therefore is us branding ourselves through messages, using clinical vignettes. What have we done, what impact has it had, and what are we trying to accomplish? People need to know the answers to those questions if they are going to agree to partner with us. That’s communication, that’s branding, and that’s how you succeed in any business. EPI: What will it look like for IFEM to make these structural changes in how it communicates and get everyone on board with its message? Ducharme: I’m very fortunate because I spent 10 years in private enterprise. During that time I was a physician lead for introducing the practice of physician assistants across the province of Ontario in Canada. That required doing 50-60 team building sessions, spending time talking about change management and writing about change management. With that business experience it allows me to understand the steps IIFEM needs to go through to make the change it needs to make. We have to recognize that change management with the international scope IFEM has will require patience as the change will be slower than one would see at a local level. Change management is usually stressful, with full acceptance of change sometimes taking years. It has to be constantly reinforced. It requires an introduction of new people. It requires patience. It requires a consistent message from leadership for it to occur. But in the end, change does occur. It occurs in every company and in every organization. If it’s done well, with the right leadership, it can be a complete success. IFEM will succeed in this change - emergency medical care for patients around the world requires us to change and lead the way.